Biking all year round can be difficult due to seasonal weather that keeps you off the road or trail. When you’re stuck inside, hop on a bike trainer instead! You’ll ride indoors using your existing bike with a feel similar to being on the road. Read on to learn everything you need to know about the best bike trainers and which ones suit your riding style. The best fluid trainer with enough perks to make it our top pick. This trainer simulates the feel of outdoor riding so well, you’ll almost forget you’re riding indoors. The ideal choice for a super user-friendly design that’ll have you cycling in no time. The unique blade design generates progressive resistance to simulate real-world riding. A magnetic bike trainer that’s budget friendly and easy to set up. 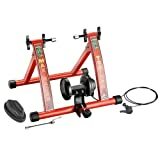 A great pick if you’re just starting out in the indoor cycling game. A top magnetic performer due to its revolutionary zero-noise design, making it the quietest trainer on the market. A great pick if you want to up your cycling game and stay in racing shape all year long. The sleek but heavy-duty frame is great for training or a warm-up session. One of the best smart trainers out there, the Direto features an immersive, interactive cycling environment that keeps indoor cycling fun. The frame can fit wheel sizes ranging from 22 inches to 29 inches. Compatible with the inRide Watt Meter for power training. Durable, stable, and solid. Fits all classic wheel sizes. An optional adapter is available to fit 20-24” wheels. Foldable and easy to store. Accommodates road or mountain bikes and fits standard wheel sizes. One of the few trainers out there with easily adjustable resistance (7 levels). Compatible with all bikes with standard wheel sizes. Well made, stable, and portable. The magnetic braking system prevents tire wear. Collapsible, compact, and simple. Features heavy-duty, tapered rollers to help you keep your balance. Fully compatible with Elite software and most other popular interactive cycling platforms. The direct drive setup prevents tire wear and eliminates slippage. Compared to other fluid trainers, this one is loud. Noisier than other trainer types because of the fan-based resistance. On the noisier side and less durable given its budget-friendly nature. This trainer is only compatible with alloy frame wheels. Extensive use can cause the rollers to start squeaking. The high price you pay for all of the interactive features. Excellent cardio workout. A good bike trainer won’t take it easy on your heart and lungs. Riding a bike can burn up to 450 calories an hour, depending on the level of intensity. Low impact. Don’t sacrifice your knees for a good workout. Biking is very gentle on the joints no matter how hard you push it. Weather isn’t a problem. Raining outside? Don’t worry about it! With a bike trainer, you can enjoy the health benefits of biking year-round, no matter what the weather does. Ride your favorite bike. Bring your bike indoors and cut down on additional workout equipment. A bike trainer uses your actual bike, which makes it a comfortable and fun ride. Bike trainers that give you control over the workout. The main drive uses a fan that creates resistance through the air. This resistance is proportional to pedal speed, meaning the challenge increases the faster you go. Typically, this type of trainer is the most affordable choice but can be rather loud. Magnets make for a smoother ride. This is a great option for you to improve your stamina and endurance. Resistance is created by a magnetic flywheel, which keeps the challenge constant while pedaling. The noise level is typically low. These trainers give you more resistance than other types. The main drive uses a silicon-based fluid to create progressive resistance you control with your pedaling speed. Given the more advanced technology, they tend to be on the pricier side. On the plus side, they whisper quiet. Improve your balance and get a more challenging ride with this type. The bike sits on top a set of rollers connected to a magnetic flywheel for resistance. These trainers can be somewhat difficult to start at first since balance is required. Their prices are comparable to magnetic trainers. If you want to avoid wear and tear on your bike wheel, remove it. These trainers plug directly into the chain of the bike and use the same types of resistance mechanisms as other trainers. The downside here is that they require more set up. Founded in 2010 in Atlanta, Georgia, Wahoo makes high-quality products for avid bikers. Among their most popular products is the KICKR. Headquartered in Hollywood, Florida, CycleOps has been making great products for years. Their most popular products are Magnus and Fluid 2 trainers. In business for over 60 years, Tacx is based in Wassenaar, Holland and is dedicated to making dependable, high-quality gear. Among their most popular products is the Antares Roller. $250 and under: The budget-friendly price point. You’ll find a couple of basic options that get the job done without fancy bells and whistles. $250-$500: For a little more cash, you’ll see good budget options with more basic features. They’re well-made and durable, so you can expect them to last a while. $500-$1500: The middle-to-high range of bike trainers, rollers, and low-end smart trainers. This range delivers more features and more bang for your buck. $1500 and above: Beyond the high-end price point, you’ll find fully-featured smart or direct drive trainers. These models will give you the most control and interaction with your riding experience. The part that latches onto the bike’s wheel or frame. Many are compatible with most bike wheels, but it’s best to check ahead of time. The quality of this part will affect how stable your ride is and how long the trainer will last you. Where the magic happens for roller trainers. A long metal spinner turns against the bike wheel to generate resistance. Many trainers come with extra rollers for the front wheel. Quality is important here since smoother rollers offer a better ride. Extra bars stabilize the bike. If you want to take balance out of the equation, look for a trainer with heavy supports to keep the bike in place. Keep track of your workout stats. Basic onboard computers can record speed, distance, and the like. Sometimes, third-party biking apps can sync your ride data so you can check your progress anytime, anywhere. The features that make your ride more interactive using a screen or tablet. Typically, these trainers are compatible with virtual riding software like Zwift. Direct Drive vs. Wheel-on: Do you want to keep your rear wheel or not? Direct trainers plug directly into the chain of the bike and require removing the rear wheel. Wheel-on trainers use a roller that turns against the bike tire for a simple set up. On the downside, this may wear the tire down or chip the frame. Interactivity: Do you prefer a basic riding experience or something more interactive and engaging? Smart bike trainers are the go-to choice for a more immersive experience. If you’re someone who gets bored staring at a wall while riding, these smart features are for you. Resistance: Some trainers feature on-the-fly adjustability (progressive resistance) during the ride, while others don’t. Progressive resistance tends to feel more natural, but consistent resistance is better for more controllable workouts. Space: Bike trainers need enough space for the trainer itself and the bike frame. Rollers tend to take up more space – usually a foot or two in addition to the length of the bike itself. Shipping/Assembly: Generally, both shipping and assembly are very convenient. All components ship in a single box and require minimal assembly. Bike roller frames may need to be assembled or unfolded. The best of the best when you want the best experience like a quiet, super smooth, progressive feel. The flywheel weighs 6.25 pounds and gives the trainer a superior ride feel compared to competitors. It comes fully assembled and is easy to set up. The frame fits bike wheels ranging from 22 inches all the way to 29 inches. For some power training, hook the trainer up to a Kinetic inRide Watt Meter to see how much juice you’re using. Overall, this trainer is stable, solid, and durable; a great pick for indoor rides. One downside to the Kinetic Road Machine 2.0 is the noise level. Compared to other trainers, especially other fluid models, this one is on the noisier side. If you don’t want to irritate the neighbors, a magnetic trainer might be the better option. This one will save you money if you’re just starting out with indoor cycling. Its low price point is budget friendly, and set up is easy. It folds easily for storage or transport and comes with an anti-clip pad for the front wheel. 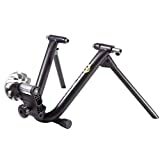 This trainer will work with road or mountain bikes and can accommodate wheel sizes of 26 inches, 27 inches, and 700c. The ride on this trainer is smooth and quiet, and resistance is adjustable with seven different levels via a handlebar-mounted switch. When compared to other trainers, this one is noisier and less durable. 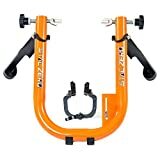 If you think you’re going to be cycling a lot, a higher-end bike trainer may stand up to greater use and abuse than this pick. CycleOps is one of the best makers of bike trainers out there. The blade design generates a good degree of resistance you can change with simple gear shifts. This one is ideal for a real-world feel on a super straightforward frame. Like many bike trainers, this one will fit most classic wheel sizes. With an optional adapter, this trainer can fit 20- and 24-inch wheels as well. The Wind Trainer is foldable and is easily stored in its compact form. Adjustable rubber base pads allow you to level this trainer on any floor. The main downside of this trainer is the noise it creates. Because of the blades pushing air around, it’s louder than other trainer types. You may want to consider another type of bike trainer if a quiet ride is a priority. The best choice when you want a good ride without the noise thanks to its magnetic braking system. The brakes prevent tire wear, so you never need to worry about your treads wearing out from indoor training. The trainer is compatible with all bikes that use alloy wheels. It works with the road, tri, mountain, and cross/hybrid bikes, fitting most common wheels. Incredibly stable and super portable, this trainer is compact and durable. It comes fully assembled and features a reliable lifetime warranty. One major downside of this trainer is the lack of compatible smaller wheel sizes it can fit. If you ride a bike or trike with smaller 20- or 24-inch wheels, you might want to check out other options, especially roller trainers. A great pick if you want to improve your riding abilities and stay in shape all year long on a simple, well-made trainer that’ll get you the results you want. It’s also ideal if you warm up before races. The Tacx Antares Roller trainer features heavy-duty, tapered rollers to keep the bike from running off of the frame. The Antares trainer is collapsible and compact, measuring a sleek 31.5 inches when folded. The main downside to this roller is the squeaking that’s common with extensive use if you don’t oil the frame periodically. You may find it difficult to use given the balance requirement, but this does improve the more you use it. The bike trainer with some brains, the Direto trainer is fully compatible with Elite software and most other interactive cycling platforms. This unique feature allows you to go online to challenge other cyclists. The direct drive setup prevents tire damage and eliminates slippage. Loaded with great features, this trainer is able to simulate slopes of up to 14% and boasts a 1400-watt power output at 40 km/h. It’s also compatible with both road and MTB frames, folds up quickly for storage and is super quiet. The only real disadvantage is the price point. You’ll pay more compared to other types of bike trainers that lack smart features. Some interactive or virtual reality biking services also require a monthly subscription, meaning you’ll pay more to use the immersive features. Get the most out of your new bike trainer with the following tips and tricks. Use a tire block or trainer mat to limit movement while cycling. Exercise 30-60 minutes, five times a week on a bike trainer to see the most improvement to your health. Dedicated trainer tires are useful to reduce wear and tear on your bike. Set up a comfortable cycling environment that includes at least one fan to keep air circulating. Do short but challenging intervals on your trainer. Go hard for a few minutes, then do more sustainable intervals of 10-12 minutes for a great HIIT workout. Q: How do I change resistance on the trainer? A: Changing the resistance depends on the kind of trainer you have. Magnetic trainers, for instance, have fixed levels of resistance produced by a magnetic flywheel. Other trainers offer progressive resistance or use the bike’s gears to change the difficulty. Q: Will a trainer hold a fat tire bike? A: Typically, a bike trainer requires a slick or road tire to work properly. A fat tire bike may be too knobby or large to fit properly. Roller trainers, on the other hand, may take smooth, beach fat tires with a flat tread. Q: How much noise is created at high speeds? A: The amount of noise really depends on the type of trainer. Wind trainers generate the most noise and can sound like a fan. On the other hand, some magnetic and fluid trainers are very quiet and usable in almost any setting. Q: Do I need to take the bike wheel off? A: Only direct drive trainers require removing your bike’s rear wheel. This is because the frame of the bike attaches to the frame of the trainer. If you don’t want to remove your rear wheel, a trainer with a roller is a good alternative. Our top pick for a bike trainer is the STAC Zero Base Indoor Trainer. It’s ultra quiet, compatible with many models, and wallet-friendly. If you’re looking for a budget pick, we recommend the 1113 RAD Cycle Products Max Racer. It’s a good option if you’re new to indoor cycling. What do you think of our picks? Do you have a favorite bike trainer? Let us know your thoughts in the comments below!